Most of us have had a treasured planter or pot, one we wanted to reuse and feature in our home or on the porch. It can be easy to become so focused on the container at hand that we forget the needs of the plants we plan to place inside. A mistake made often by novice gardeners is to neglect to judge the depth of pot needed for a plant’s root system. There are many plants from which to choose for use in shallow pots. Several vegetables perform well in shallow pots. Lettuces and onions have roots that do not extend deeply into the soil, allowing them to be grown in several inches of potting mix. Even root crops like radishes are well-suited to such containers. Cucumbers appear to require a lot of space, but it is mainly their above ground vines that need room to spread. Not all shallow containers are the same. Don’t forget to take into account the size of the mature plant. Taller crops may need support for the height they attain. Brassicas, while shallow-rooted, often require a wide area in which to expand, making them a better choice for planters with a wide circumference. Herbs in general have shallow root systems. Oregano, thyme, basil and sage are among the options suited to smaller containers. 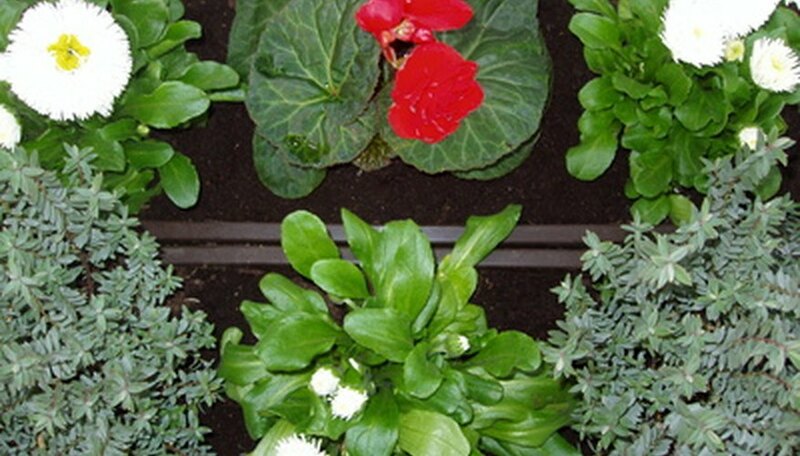 Planting herbs in a shallow pot allows you to achieve good results while avoiding wasting soil. The pots can be kept lightweight and easy to move, which is a bonus for gardeners who have difficulty lifting and manipulating heavy containers. According to the University of New Hampshire Cooperative Extension, most annual flowers are shallow-rooted, making them a safe bet for pots that aren’t deep. Popular flower selections for containers include petunias, lavender, impatiens and zinnias. Plants with shallow roots need more frequent watering. The need for water can be exacerbated by the material with which the pot was made. Clay pots lose moisture more readily than metal or plastic options. Hostas grow from a rhizome with shallow roots Growing them in pots can help you more easily protect the plants from hungry snails and deer that love to feed on the leaves. Hostas are suitable for sunny or shaded locations. Gardeners can select among thousands of cultivars, providing texture, color variety and bell-shaped flowers on tall stalks. Azaleas and rhododendrons are examples of flowering shrubs that have shallow--but spreading--root systems, making them a good match for containers that may not be deep, but are wide-mouthed. The University of Missouri Extension suggests that the plants have trouble penetrating heavy or rocky soils. Growing them in pots makes it easier to provide the loose, acidic soil and drainage the plants need. Which Vegetables Grow Best Together in a Container Garden?